/ Kilbroney River running through Rostrevor. / Gorse and Heather brightening up a dull day. / St Patrick's Way marker posts keeping you on track. / Looking across to the Cooley Peninsula on the shores of Carlingford Lough. Enjoy the changing landscape as you follow country lanes and green hillsides on your way towards the coast on this undulating day. Today you will get a great sense of the changing landscape as you walk towards the coast. 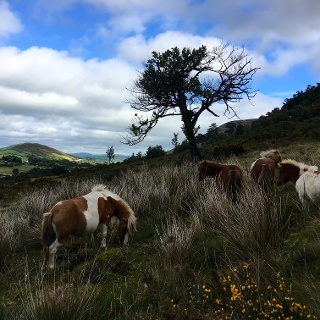 Walk down country lanes and past rolling green hillsides with views over Carlingford Lough and then views of the Cooley Mountains and the Mourne Mountains as you approach Rostrevor. Rostrevor has barely changed from its Edwardian heyday and there are many fine 18th and 19th century homes to view. Lying on the edge of Carlingford Lough, this idyllic little resort town is picturesque and has a C.S. Lewis inspired Narnia Trail. Atmospheric pubs and enticing eateries all serve to ensure that you will have a marvellous evening here. Take a stroll down to Carlingford Lough to watch the sunset in the evening, which is a great experience. Much of this route follows country roads with no pavements so take good care. Although the roads and lanes can be quiet it's always best to walk on the right to face any oncoming traffic and make yourself as visible as possible. A pair of sturdy walking trainers will be enough for this route if you dont want to wear full hiking boots. Along with the rest of your usual gear for a day outdoors. Remember to pack a wind/waterproof and an extra layer. There are no options for food or drink whilst en route but there is a good choice of stores and cafes in Newry for you to stock up on supplies before you set off for your walk today. On arriving in Rostrevor there are plenty of pubs, restaurants and two small stores. Loch Cairlinne in Irish, literally translated as "City of the Pool" is a sea loch that forms part of the border between Northern Ireland and the Republic of Ireland. On our side in County Down the Mourne Mountains dominate the skyline and on the opposite shore, in County Louth, the green slopes of the Cooley Mountains and Peninsula can be seen. Carlingford Lough was named by the Vikings although there is no evidence of a permanent Viking settlement here. Now a popular spot for sailing, angling, kayaking and bird watching this stretch of water is also famed for it's oysters which can be found in many restaurants across the country and beyond. Located close to one of the entrances to Kilbroney Park and running alongside Kilbroney River, in Rostrevor, Fairy Glen is a lovely riverside walk with plenty of wildflowers to be seen. So called Fairy Glen as residents used to believe it to be home to the 'wee folk' so would be careful to avoid the route at night when the fairies could be heard dancing to otherworldly music. 0.00 km – Standing with your back to the front doors of the Canal Court Hotel, TURN LEFT to walk along Canal Quay. 0.05 km – TURN RIGHT to cross the road at the traffic lights, then at the end of Needham Bridge TURN RIGHT again onto The Mall. 0.45 km – Cross Mill Street and continue STRAIGHT ON. After 100m you will pass Newry Market and church on your left side. 0.70 km – At the end of The Mall cross the wide main road then TURN LEFT to follow William Street. Soon crossing two more roads at traffic lights. 0.95 km – TURN RIGHT onto Boat Street then, after 50m, TURN LEFT onto Courtney Hill. 1.50 km – The pavement finishes here so from now on you will be walking directly on the road as you continue uphill. Keep to the right so you are facing any oncoming traffic, also use grass verges where possible. 2.20 km – TURN RIGHT at the junction, onto Moor Hill Road. 3.00 km – TURN LEFT at the end of Moor Hill Road onto Common School Road. 3.60 km – TURN RIGHT at the junction, onto Bettys Hill Road. 5.10 km – TURN LEFT at the crossroads, onto Lower Carrogs Road. 5.80 km – BEAR LEFT to stay on the road, continuing uphill past the junction for Ryanstown Road. 6.60 km – BEAR LEFT again to stay on the road, passing Carrogs Road. Blue/Yellow St Patrick’s Way sign again points the way. 7.60 km – TURN RIGHT at the junction to follow the main road through Derrylecka. 7.70 km – TURN LEFT to leave the main road at the St Patrick’s Way sign then continue on this quieter road as it BEARS RIGHT. 8.70 km – STRAIGHT ON at the junction, now following a stone wall on your left side. 9.10 km – TURN LEFT onto Bridge Road. 9.30 km – TURN RIGHT at the junction to join a narrow lane heading uphill. Stay on this road for the next 3km. 12.00 km – At the cross roads continue STRAIGHT ON to Contafleece Road. 13.10 km – At the end of the road TURN RIGHT then, after 20m, TURN LEFT at the next junction. Another St Patrick’s Way sign points the way. 13.60 km – TURN RIGHT at the junction, onto Leavalleyreagh Road. 16.20 km – KEEP LEFT at the split in the road to continue on Leavalleyreagh Road. 16.90 km – TURN RIGHT onto Green Park Road then follow this the entire way to Rostrevor. 18.40 km – TURN RIGHT at the junction then after 20m finish your walk at the top of Bridge Street, Rostrevor.